26 april 2006 has been a very special day for Deaf Flanders. 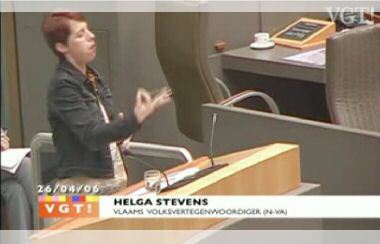 Flemish Sign Language has been recognized by law on this date. SignFuse was there and created a video documentary. As the recognition of Flemish Sign Language would be a historical moment for all Deaf generations, for the dead and the unborn, I was very encouraged to create a documentairy about the event. Here, in Finland, every single event of importance is motion captured. I’m pretty used to it and a giant archive is available. As you can note in my reportage The Power of Media for the Deaf, the first film in Finland had even been recorded a century ago, in 1907. That the Deaf community of Flanders, the root of my being, doesn’t have the access to such a proud heritage of moving images, touched my heart painfully. Deaf people have to be proud to believe in themselves. Now what’s a better resource for proudness than a glorious history? Okay, there are many written resources, but isn’t the eye of a Deaf person the channel to his heart? I had the great opportunity to watch the archive of the Finnish Culture days of the Deaf (kulttuuripäivät). I was really impressed. About 25 hours of video had been recorded over a timespan of +- 40 years. The archive revealed changes in Deaf mentality, Deaf culture and more. It was highly revitalizing to see those people alive, showing their frustrations and joys. I have made a selection of the best video’s out of this archive for the ceremonial movie of the 50th Culture Days. As Flanders would have Flemish Sign Language recognized, and no professional or semi-professional person was going to film this, I felt it as my duty to fly over and back and capture this historical moment on tape. Fevlado, the Flemish Association of the Deaf granted me support and paid my flight, for which I am very thankful. And off I went, 1 day back home with a 3CCD cam, really happy about the joyful event, but even more happy I could save this day for the generations to come. In assistance of reporter Hilde Verhelst I captured 2,5 hours of film, of which I would finally destillate a 20 minute documentary in Final Cut Pro. The result has been gifted by SignFuse to the Flemish Deaf community and Fevlado. Fevlado will sell this movie, “Erkenning van de Vlaamse gebarentaal”, in DVD format. You can also view this video online at Google video, but unfortunately Google is twisting our nicely 16:9 formatted video to a crappy 4:3 format. Many thanks to Hilde for reporting. Many thanks to Fevlado to make this historical document possible.